The community dates from early 1857 when Amelia Vancil and Chauncey Warren Moffet decided Bell County needed another town. A store was opened in the 1860s and the community was known by a variety of names. 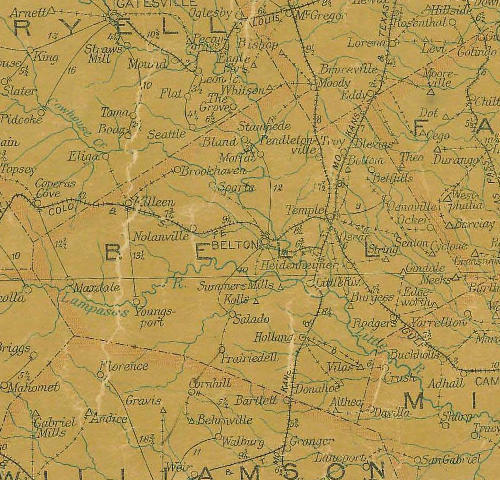 Mount Green, Gandertown, Moffatville and Moffatttown. 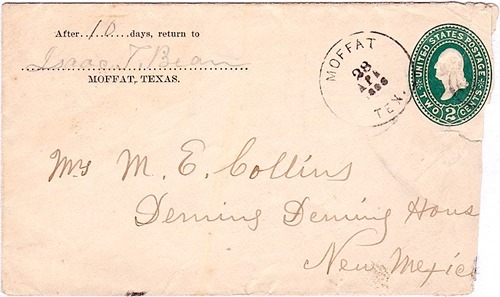 In 1872 in order to get a post office, townsfolk had to to decide on a permanent name and they settled on just plain Moffat. The 1880s were good times for Moffat. Besides having most essential businesses, three churches and a school, it enjoyed a healthy population of 200. Moffat peaked in 1890 with a population of 350 as its high-water mark. But with the dawning of the Twentieth Century. Moffat had declined to just 147 residents. The post office closed and mail was diverted to Bland. In 1925 a new post office was opened but closed again in 1926. After WWII through the mid 1980s, Moffat's population see-sawed between 75 and 100 residents. The local school merged with Belton 's ISD in the mid 1970s. The population was given as 150 for the 1990 and 2000 census. A historical marker on State Highway 36 commemorates the town.